Welcome to the Fit Small Business Xero training course! In this lesson, we’re going to cover how to mark bills that have been paid online in Xero. Why Is It Important to Mark Bills as Paid? In order for you to keep track of what you owe to your suppliers, otherwise known as your accounts payable balance, you must enter your bills into Xero. In the previous lesson, we showed you how to do this. The other key component to having an accurate accounts payable balance is to mark your bills as paid once you have sent the payment. In this lesson, we will show you how to record full and partial bill payments whether you have paid online or with cash. We’ll be covering check payments in the next lesson. How Do I Mark Bills that have been Paid Online? Follow the steps below to mark bills paid via cash, ACH or debit card. We will cover how to make payments via check in the next lesson. 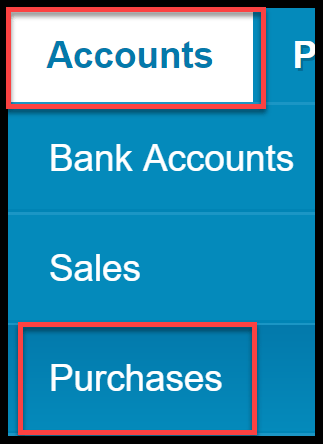 From the Xero Dashboard, select Accounts and Purchases as indicated in the screenshot below. Bills are grouped into 4 categories in this screen; draft, awaiting approval, awaiting payment and overdue. Below is a brief description of each category. Draft – Bills that have been entered but not submitted for approval or payment. Note: Bills in a draft status do not impact your financial statements. Awaiting Approval – Bills awaiting approval have been submitted to a user who has approver permissions. Check out How to Invite Users tutorial to learn which users can approve bills. Note: Similar to bills in a draft status, bills that are awaiting approval do not impact the financial statements. Awaiting Payment – Bills awaiting payment have been approved and can be paid via cash, ACH, debit card or check. Note: Bills awaiting payment do impact the financial statements. Overdue – Bills that fall into this group were not paid by their due date. These bills have been approved and can be paid via cash, ACH, debit card or check. Note: Overdue bills do impact the financial statements. Click on either the Awaiting Payment or the Overdue group to display the bills that you want to pay. Step 3 – Select the bill(s) that you would like to pay. A list of the bills that can be authorized for payment will display as indicated in the screenshot below. Select the bill that you would like to mark as paid by putting a checkmark in the first column as indicated in the screenshot above. Step 4 – The bill that you selected will display. Scroll down below the bill to see the Make a payment section. Complete the fields per the instructions provided below. Amount Paid – This field will autopopulate with the amount that was entered for the bill. If you are going to pay a different amount, then you can enter the amount that you would like to pay in this field; otherwise, there is no need to make any changes. Date Paid – This date should be the date that the money was withdrawn from your bank account. If you don’t have that date, just be sure to use a date that is closest to the withdrawal date. Note: Using the correct dates will ensure a successful bank reconciliation. Paid From – Indicate the bank account that the payment will be made from. Reference – This field is optional. However, I do recommend that you indicate the payment type (cash, online, ACH or debit). This info could come in handy when reconciling your bank account. Pay by check – We will walk through how to make a payment via check in the next lesson. Add Payment – Click this button when you have completed all of the fields. In the background, Xero will mark the bill as paid which will automatically update your accounts payable balance. Below is a sample bill from a fictitious company, Acme Web Pros Plus. There is a Paid stamp in the upper left-hand corner of the bill and the payment amount and date appear in the lower right-hand corner of the bill along with the updated amount due of 0.00 for this example. Sample Bill after it has been marked as paid in Xero. That wraps up the section on how to mark bills paid online. The next lesson in our Xero Training Course will be how to pay bills with a check. In this lesson, we will walk you through how to print a check from Xero to pay a bill. To access this lesson or any of the others in the series, click here. For a free 30-day trial of Xero, click the link below.